"Compassion Fatigue is a state experienced by those helping people or animals in distress; it is an extreme state of tension and preoccupation with the suffering of those being helped to the degree that it can create a secondary traumatic stress for the helper." While the effects of Compassion Fatigue can cause pain and suffering, learning to recognize and manage its symptoms is the first step toward healing. The Compassion Fatigue Awareness Project© is dedicated to educating caregivers about authentic, sustainable self-care and aiding organizations in their goal of providing healthy, compassionate care to those whom they serve. If there are any other services or materials you would like to see available on either site, please Contact Us! CFAP Founder Patricia Smith recently gave a presentation at the TEDx SanJuanIsland event. Check it out! CFAP Founder Patricia Smith's seminal book on recognizing Compassion Fatigue, To Weep for a Stranger, is available through Amazon. Grab a copy here! Also available for Kindle here! Help us create another exciting venue for raising compassion fatigue awareness! We'll post new information on a regular basis. Become a fan! With more than 20 years of training experience, CFAP Founder Patricia Smith writes, speaks and facilitates workshops in service of those who care for others. If you're interested in having Patricia address your organization or group, click here! 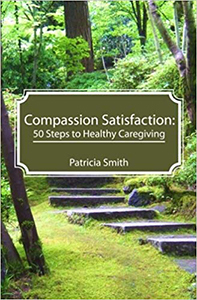 CFAP Founder Patricia Smith's newest book guides readers through 50 steps to Compassion Satisfaction. © 2017 Compassion Fatigue Awareness Project. All rights reserved.